I'm not really sure why, but this Saturday morning finds me both contemplative and impassioned; more than usual, for some reason. Perhaps it has something to do with the silly little belated birthday card that a friend sent me. Let me explain .... inside the card was a note full of trivia, listing all the people throughout history that have been born on my birthday. You've seen those, right? Out of curiosity, I perused the note to see if I had anything in common with those who made the list. As I perused the categories, I saw the familiar names from our modern culture .... Patrick Swayze, Robert Redford, Shirley Temple, Denis Leary, Roman Polanski; all known for their flair of the dramatic and love of the spotlight --- characteristics that do not describe me. Then there was Caspar Weinberger, former U.S. Secretary of Defense; and Timothy Geithner (picture me holding my nose), current U.S. Secretary of the Treasury .... I definitely don't have anything in common with him! I may not be an ex-Federal Reserve Bank President, but I know that whatever he's done to "fix" the financial crisis, it ain't working! There were the various athletes, singers, and artists. Anyone who knows me well, knows that I wouldn't be the first one you picked for your dodgeball team; I only sing well in the shower; and only got an A in Art Class because I turned in a 40-page term paper. So, if you believe like I do, that God is the Creator of the Universe, and there is perfect order and symmetry in His work, then I must possess something in common with someone on this list! And then I found them! No wonder they weren't at the forefront of the checklist. You have to go back centuries to find them, which only goes to show what I have always felt.... I was born at the wrong time. The first one, I had actually forgotten about; she was someone that I had been made aware of during my childhood fascination with the founding of our country. 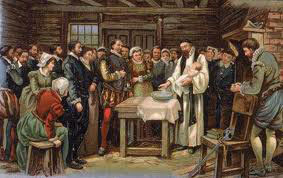 Virginia Dare was the first European Christian child born in America. I can remember reading the exotic story of her birth in Roanoke, Virginia, the first English colony established in the New World. Her grandfather, the Governor of the colony, returned to England for fresh supplies and was unable to return for three years due to English ships being confiscated during a prolonged war with Spain. Upon his return, he found no sign of the nearly 120 people he had left behind. 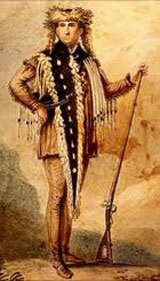 The mystery of the "Lost Colony" remains unsolved to this day. But I've always felt an affinity, and an unusual pride with the fact that Virginia and I share the same birthday, even if they are 366 years apart. As a young girl, I felt a bond with this little child who died before her third birthday. She holds a unique honor; she was there at the beginning of what I perceive to be a glorious and noble accomplishment --- the founding of a country like no other; a country that celebrated independence and self-rule; a country that believed men could worship their God unimpeded, while living their lives unrestricted, and free from tyranny. She represents adventure and courage; promise and potential, all the things that I believe our country symbolizes. She holds a distinctive place in our national history and I am proud that I have a link to her. The second person was someone whom I knew well, but had no idea that we shared the same birthday. Captain Meriwether Lewis was the leader of the Lewis and Clark Expedition of 1804-1806, which just happened to launch from Wood River, Illinois, the town I was born in. Lewis may have been born 179 years before me, but he embodied everything that excited me about our history; he answered the call of his nation and was willing to put his life on the line, charting unknown territory and braving unknown and dangerous perils. How I longed to live during the dawning of our country; during those years when the American "experiment" was raw and new. I used to dream of being able to contribute something as worthwhile as the patriots of the Revolution and those who increased our boundaries to the far-flung frontiers of the North American continent. Unfortunately, Captain Lewis died far too early. At the age of 36, he died in what is still a contested manner. For years, his death has been considered a suicide, but there are those who maintain that he was murdered, perhaps due to an ongoing dispute with the War Department. Throughout the intervening years, there have been attempts to exhume his body for forensic analysis; even as late as 2010 (the Department of the Interior rescinded an earlier 2008 approval). Regardless of the reason for his early death, no one can take away his contribution to our nation. And there you have it. Of the 158 people determined to have been born on August 18th, ranging from the year 472 to 1992, (that's a span of 1520 years!) there were only two that I feel any connection to. Maybe I'm just sentimental, or maybe I'm just envious of the impact they both made on the country that I happen to think is the best in the world. I love the passion and the devotion with which both of these American icons depict the American spirit. Virginia Dare's parents braved the New World and set the precedent for a new breed of people; those that accepted neither fear or defeat in establishing a new nation. And Meriwether Lewis showed unrivaled courage, spirit and heroism in accepting the challenge to explore and claim an unsettled land; going beyond the boundaries established by those who wished to limit the inherent American desire for "more elbow room." As I sip my morning coffee, I am deep in thought. Is there anything I can, or will, ever do that can come close to having the impact that these two predecessors have left on our nation? The answer is an emphatic, "NO!" I've wasted too much time. But now as I see my country; the nation they helped define; gasping for a new breath of God-endowed "Life, Liberty and Pursuit of Happiness", I am committed to re-kindling their spirit and purpose among my fellow countrymen. God intended for this country to reflect the Good that man can do when given the freedom to reach his unlimited potential; being guided by God-fearing principles and prayerful petition to his Creator. Somehow, we have lost the confidence that allowed Virginia Dare's parents to make that long, dangerous ocean voyage to a land unknown. And we no longer possess the daring determination that motivated Meriwether Lewis to push beyond the boundaries of civilization. These character traits require action and faith. It's my time to exercise both. Psalm 40:4-5 "Blessed is the one who trusts in the Lord, who does not look to the proud, to those who turn aside to false gods. Many, Lord my God, are the wonders you have done, the things you planned for us. " It is so interesting to contemplate those who came before us. I. too, wish I could have been born at the beginning of our country. To be a part of that brave generation would be such an honor. I am sad at how we've let them down.